Well a productive week, I escaped down to Wales for a few days in Newport Pembrokeshire. Painting requires more kit than I like, with watercolours, sketchbooks, easels, pochades, stools, paints, pencils, cameras, canvasses and tripods. I have however now got it organised so I can make expeditions on foot comfortably by assembling the appropriate bits and bobs in various ways depending on what I have planned. Watercolours are the lightest by far with only a small satchel needed and the paintings once dry are no problem to carry. Oils however are a different proposition so I carry one lightweight pochade that allows a 10in by 7in painting and a more substantial one that can accommodate a more generous 10in by 14 in. I had decided on this trip to do some larger pictures so the wee pochade didn’t get an outing. 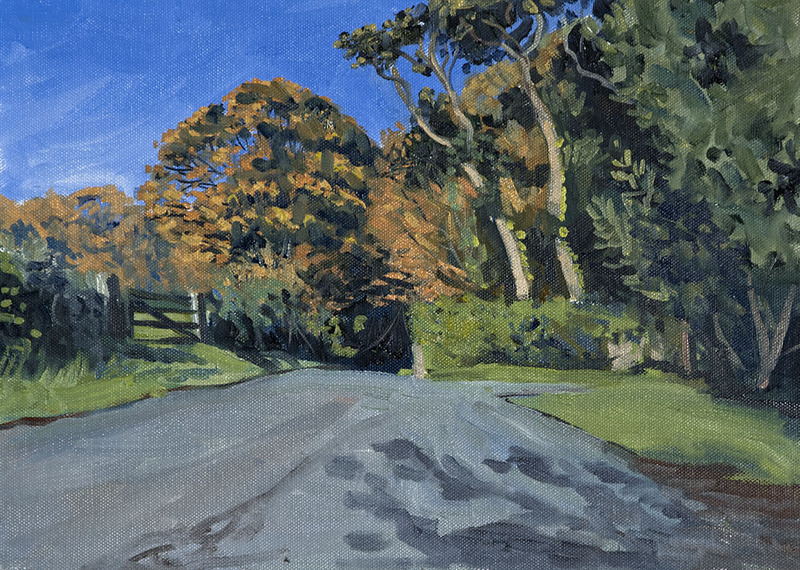 The time of year is perfect for painting right now, with low light most of the day and all the glorious autumn colours on show. To add to this the weather was dramatically changeable with clouds and showers being chased across the hills by blustery winds. So here’s what I got up to I’ll try to put them in order. After my drive down I was straight out. I had spotted this scene on my last visit but the light had been wrong but when I arrived this time the view was perfectly lit with dark shadows lit by dramatic splashes of sunlight. 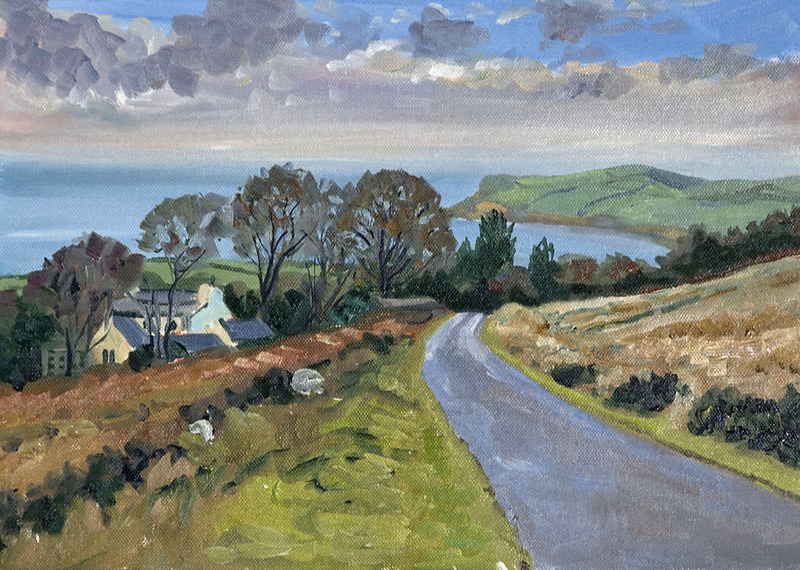 This is all very well but on blustery days like this the scene looks different from moment to moment so you have to decide as you go along which of the lighting changes you like. 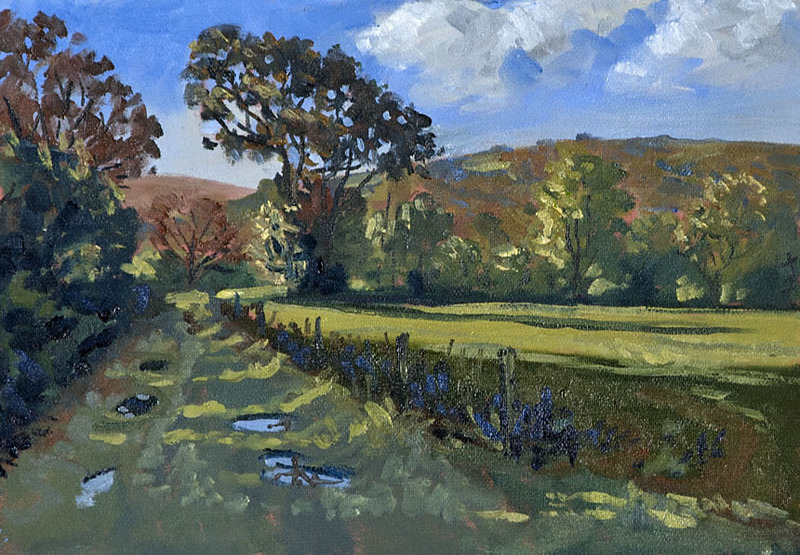 I repainted the landscape behind the house two or three times until I liked how it sat with the brilliantly lit foreground. Morning saw a dramatic storm come in from the sea. 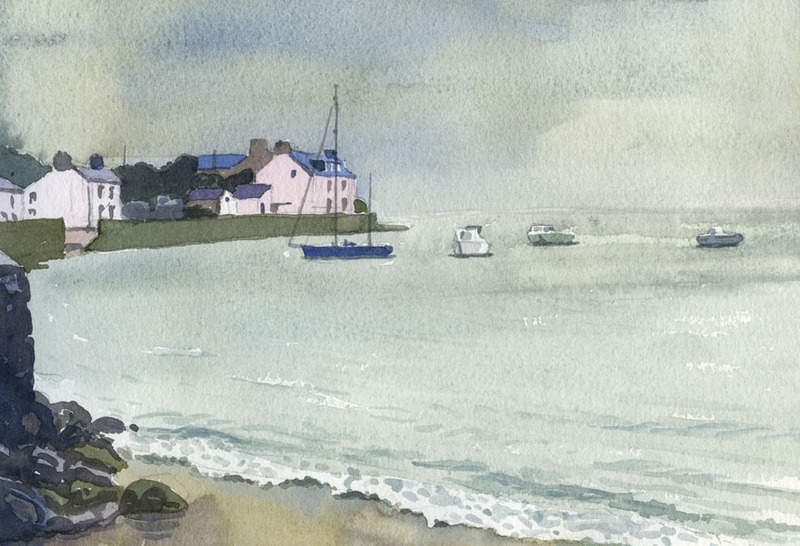 I set out intending to paint it but when I got down to the Parrog at Newport the rain was horizontal so being a wimp I sat and waited in the car. I didn’t have long to wait the wind soon harried the clouds off to the North leaving only a few tattered and defeated remnants in a ragged array across the bay. Looking to my left however a new army of ominous clouds was gathering for an assault so I knew I had better be quick. It was quite frustrating painting the sky as everything was moving so fast. 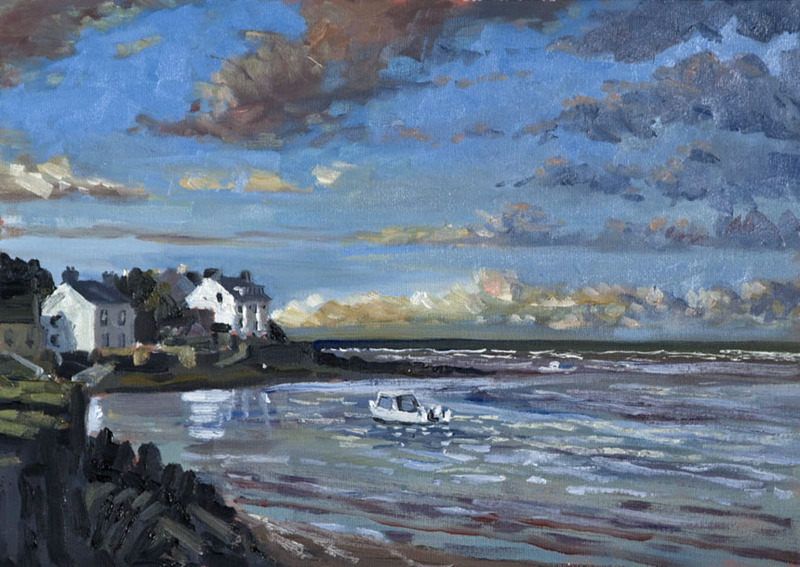 Several arrangements got painted in then scraped out but I settled for a simpler sky in the end as the first dramatic version rather overwhelmed the scene. That evening I returned to try another strategy with the clouds. This time I mixed all the hues first and started with the clouds rather than the sky. On the whole I think this worked better and I had this quite complicated cloudscape done quite quickly and it was easier to keep the colour fresh as well. Mind you by the time I came to paint the foreground I was needing my head torch to see my palette and my painting. Next day I went round the side of Carningli intending to paint the nearby prehistoric grave, but got side tracked by this simple view. The trees were a lovely mixture of dusty greens part turned to autumn reds that just had to be painted. this is a smaller one only 7in by 10 in. 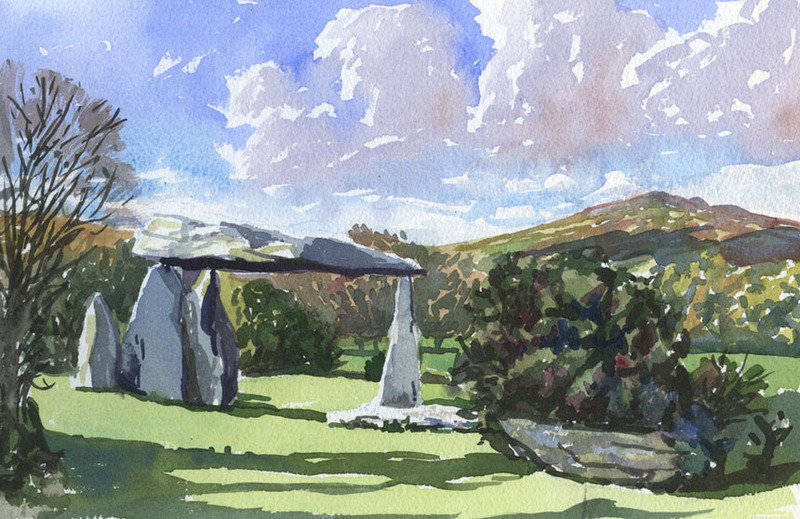 I arrived at Pentre Ifan later than I wanted but the light was still good so I settled to do a watercolour. It was very blustery with the paint getting moved across the paper by the wind. This is the third time I have painted this cromlech and none of them is really what I want so I shall have to return. I will try dawn I think as the light should be on the back of Carningli, the peak seen here to the right. One more at the end of the day. I was a bit too late here and only had 15 minutes to splash something down, but the photo I took on arriving is good and with this quick note to help it will make a studio picture I hope. 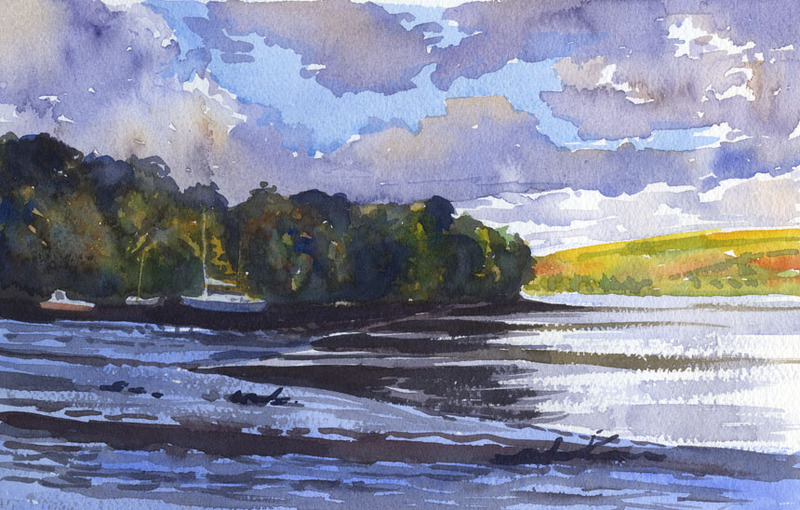 A quick sketch in passing of the mouth of the Teifi near Cardigan, just a very quick note that might make a painting. Most of this day was spent walking the coast path after a very wet start. Sometimes it’s important just to look and not to see everything as a subject in waiting or through the lens. 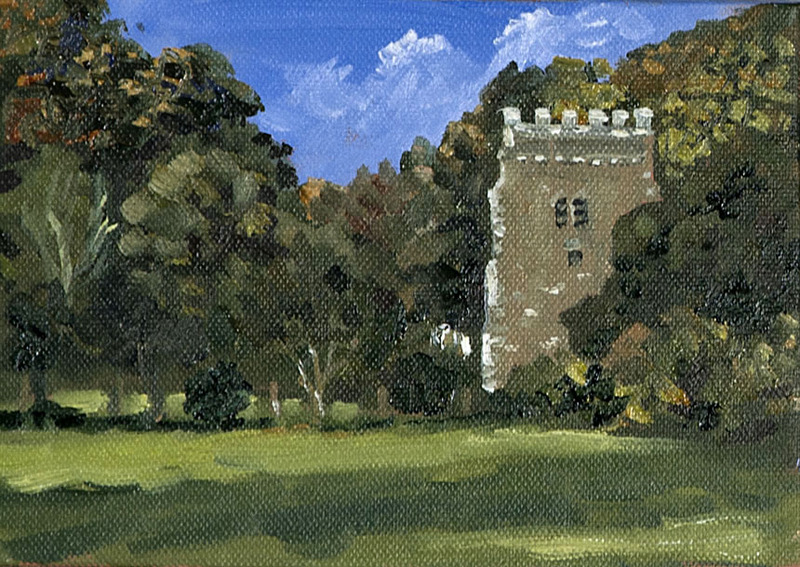 As well as the watercolour I did find the time though to do this tiny 7in by 5 in of Nevern church. Monday was advertised as the best day of the week so I set out south to Bosherton to paint the famous lily ponds. 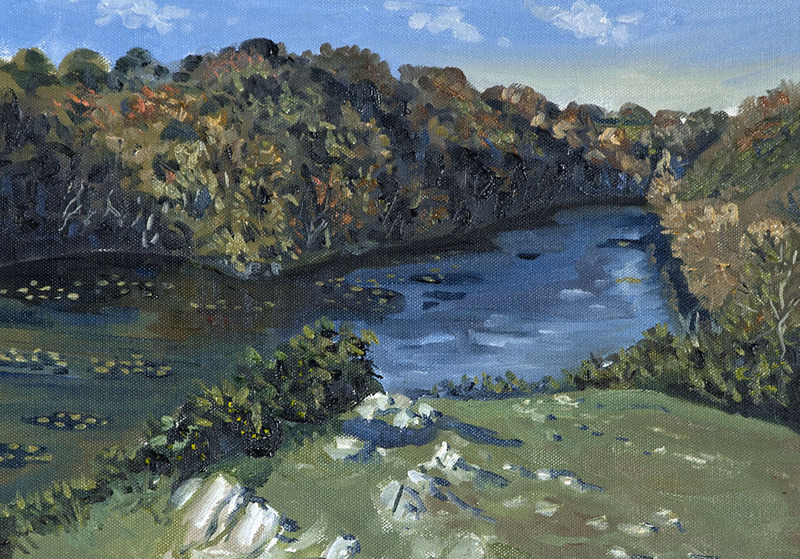 The ponds are quite hard to paint with no place to set up an easel on the very paintable low bridges that cross the ponds so I set up on this very exposed rocky outcrop that gave a wider view. Quite a difficult subject with no obvious composition I just tried to catch the beautiful colours of the ponds and trees. It was astonishingly windy and I had to tie a large rock to my easel and nearly had my palette whipped out of my hands a few times. I was on my way to try and get a view of the ponds from a different angle when I spotted this, which unlike my previous subject had a composition as plain as could be. Nice quiet spot in the sun after being blown to kingdom come on the previous painting I felt I deserved a rest and this was a real pleasure to paint. The only really tricky bit being to get the various levels of detail working together. It would have been easy to simplify into masses and still have made a nice painting but not I felt really true to the charm of the scene. 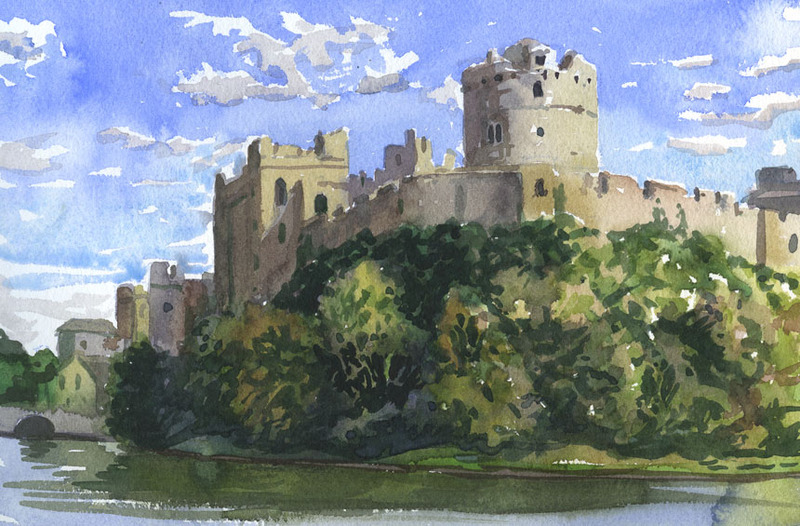 I just had time to do this quick sketch of Pembroke Castle. I must return at some stage to paint this again as there are some lovely subjects with the castle standing dramatically over the water. It was very cold and the paint wouldn’t dry so a sketch only. A very grey day, I did have plans to do this scene once every day… but I only managed twice being seduced away by other scenes… never was good at plans. This was a real challenge, completely flat light with a constant drizzle, but I enjoyed painting it. It was a relief to go off and read a book for the rest of the day though as the rain set in and didn’t let up at all. My last day and off to St Davids It was another grey day. 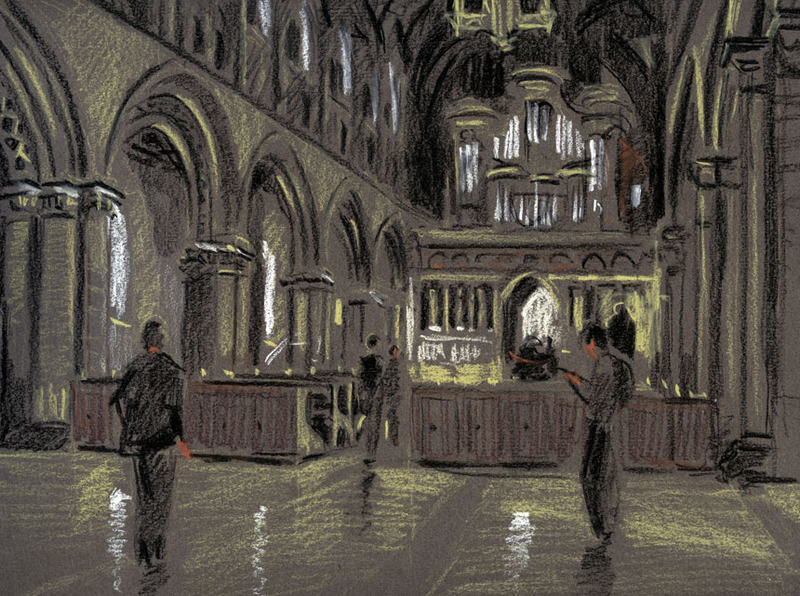 My sister in law Judy and I wandered around the town and cathedral and I sat for a while and drew this. A little girl was fascinated and kept coming back to see my progress at one point telling me I was very slow! 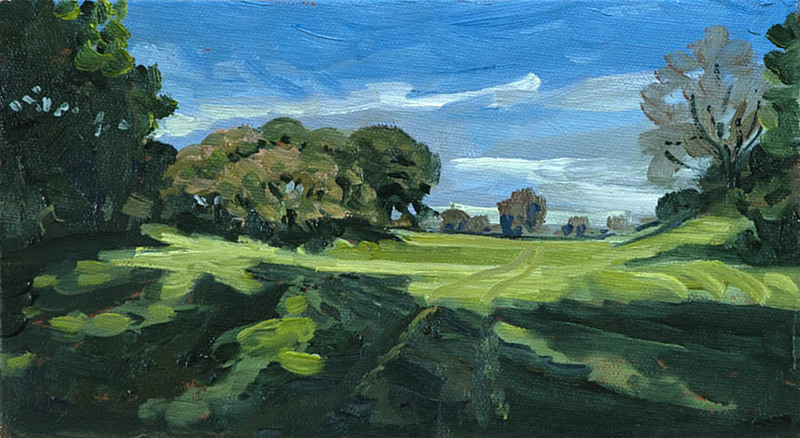 The day cleared up at the very end and my final painting was a subject I have painted many times. It didn’t disappoint with the last light of the day becoming quite magical until it faded leaving me on a cold dark hillside packing away my paints and setting off down hill for a well earned beer. This one the weather got me, I was painting away and a storm crept up behind me. The first I knew of it was when a mighty blast of rain and wind took my easel over! I sat despondently in the car for a while but it didn’t let up. 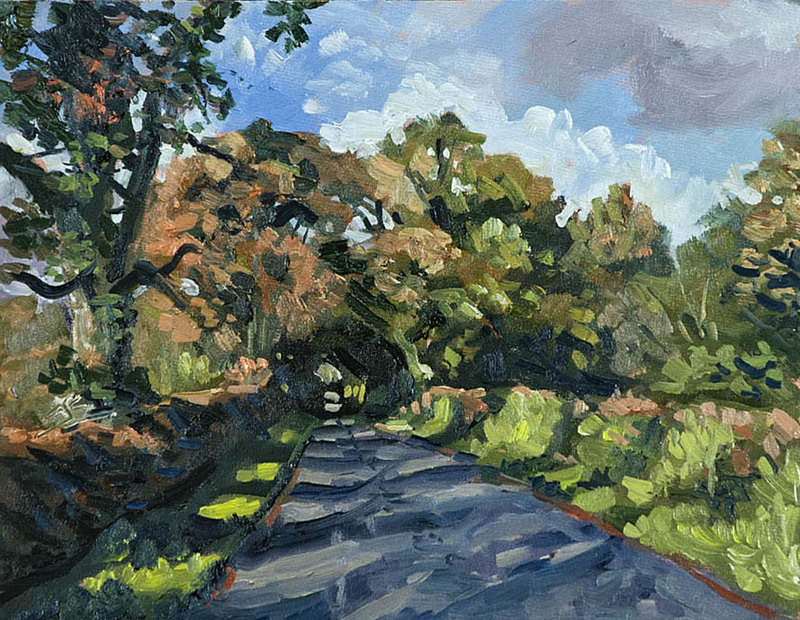 I was cross because it had been going well but only the tree shadows on the road needed finishing, so not too bad. Click for larger version. 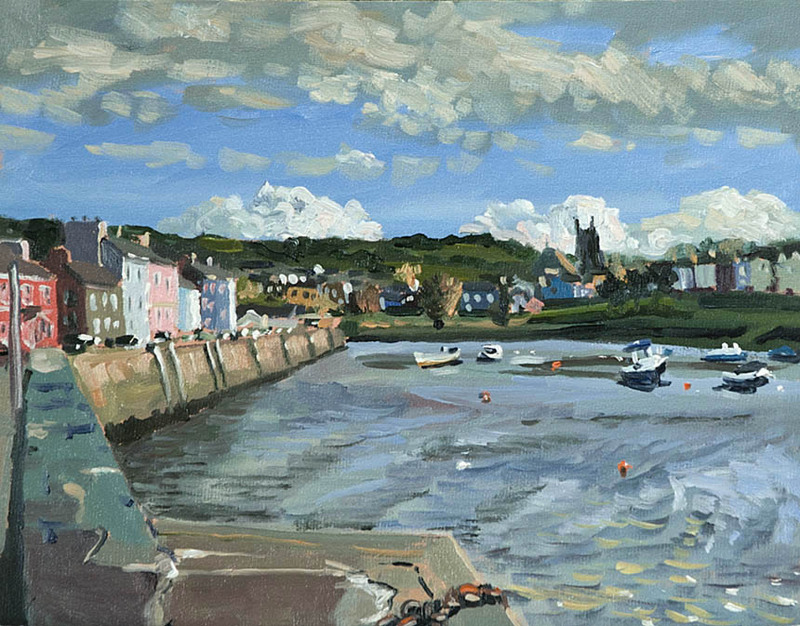 This is Aberaeron in Ceredigion the houses are all painted in fetching (and some not so fetching) colours. It has a beautiful harbour with fine Georgian houses. I would have loved to do more here so I will return to do some more paintings I hope. Click for larger version. I was on my way to Haverford West to buy some more boards as I had used up my supply. So I only had a 9in by 5in scrap to paint this on. It was a gorgeous scene and I will be doing a larger one from this and the photos I took. Still it is amazing how you can get a fairly complete impression down in 15 minutes or so if you just go for the big elements. Scratching around this week for inspiration. I have had other calls on my time, so I have had to steal time to get a few things done. 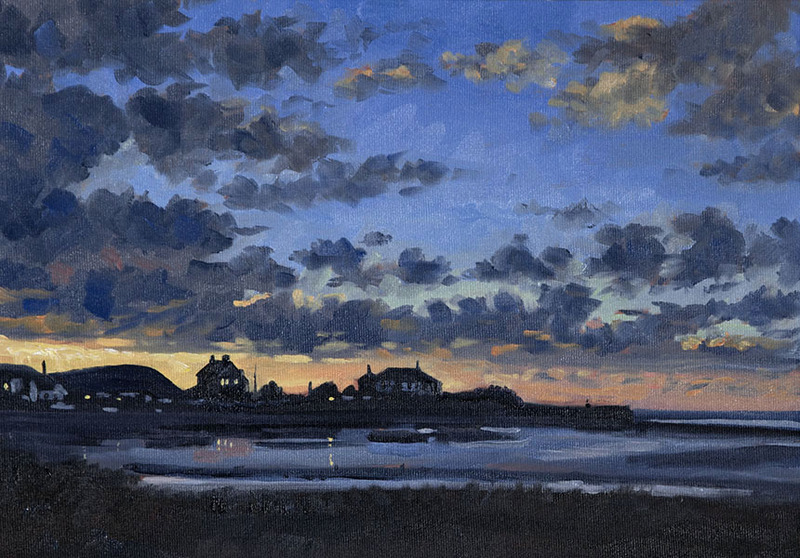 This was the reason I have decided to limit commercial work because it is very hard to keep up the impetus to paint and improve when you are forced to squeeze your own paintings into inconvenient moments. 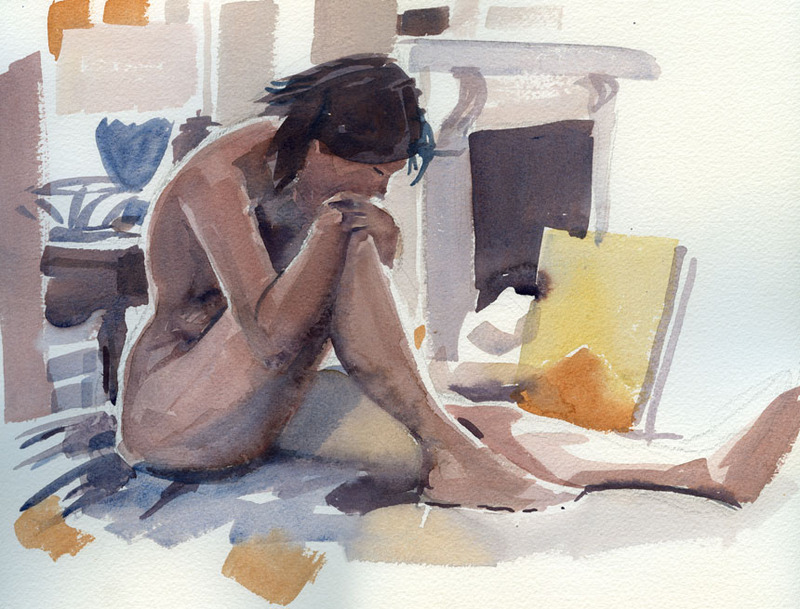 So it’s more watercolours as they are quick to paint but often go wrong and have to be abandoned. 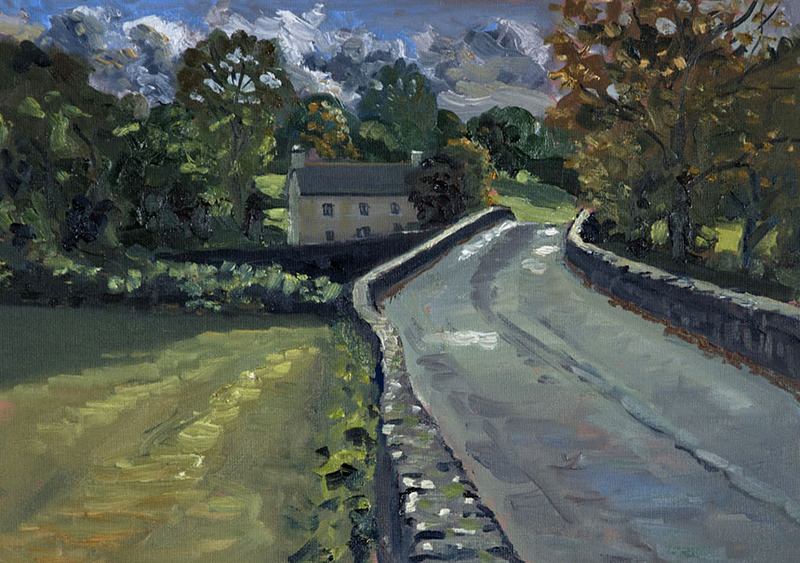 A friend posted a picture of a lock keepers cottage on the Barrow near Graiguenamanagh Kilkenny Eire that had watercolour written all over it and appropriately autumnal as well. The other was a painting I had been meaning to do for a while. 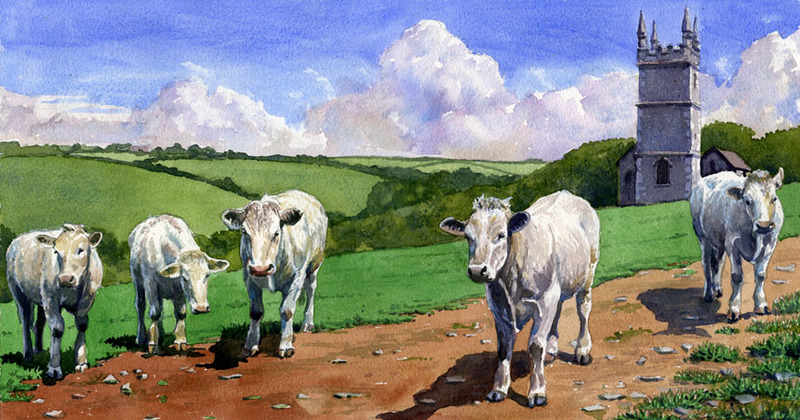 A few years ago when in Cornwall I settled to paint the very dramatic Morwenstow Church, but little did I realise there was a small herd of bullocks lurking in the dip out of sight. Within 20 minutes I was surrounded by huffing beasts trying to take a bite out of my canvas! I took a few photos of them as they made their approach as the light on them was beautiful. I took these and the less than half finished acrylic and recreated the moment. I have garnished this post with a few life paintings where I have been trying watercolours as I was getting a little too comfortable with the pastel pencils. 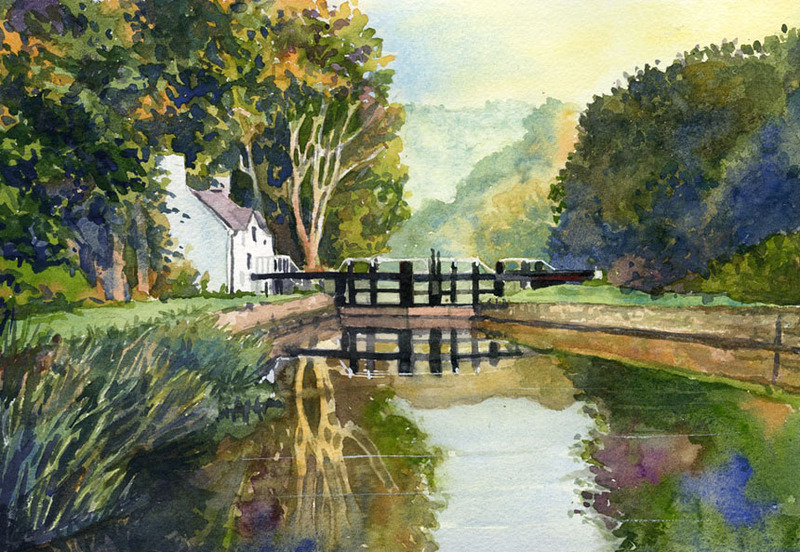 A fairly straightforward painting I had to be careful to keep the balance of green and warm orange in control and not over detail the trees, unusually for me I actually used some black on the lock gates as they had to be strong to hold the composition. Picture can be clicked for a larger view. This was great fun to paint. I tried to limit my palette and split the painting into well defined zones. The clouds and the cattle are painted in the same hues which helps unite the composition, with the warm path and cool sky acting as opponents. Picture can be clicked for larger view. I have forgone the pastel pencils for a while as I was becoming a little too comfortable with them. 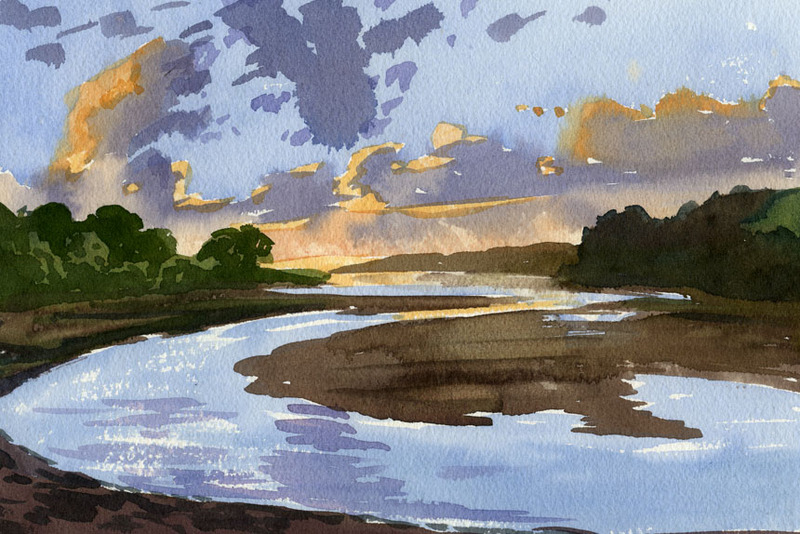 Watercolour adds an extra challenge but rewards in the feeling of spontaneity when they work… with of course the bi product of more of them ending in woe and disaster! Here’s a brave one with no drawing but 30 mins is not really enough time.